Butternut Squash and Spinach Lasagna. Photo courtesy of www.foodnetwork.com. With the winter months settling in, eating comforting and warm foods may seem like a regular occurrence. While New Year’s resolutions may be in the back of your mind, there is no need to worry when you are enjoying this take on a healthy, meatless lasagna using the best of winter produce, butternut squash. 1. 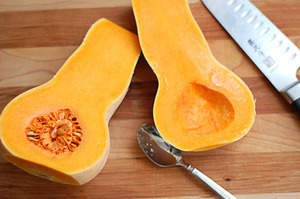 Make butternut squash puree by preheating oven to 400 degrees. Cut 1 medium butternut squash in half, scrape out the seeds, and place face down on a baking sheet with olive oil. Bake for 30 minutes, let cool, peel the skin off and place in a food processor. Add 1 cup ricotta cheese, ¼ teaspoon nutmeg, and ½ milk (more if needed). Puree. 2. Saute one large container of spinach, 1 cup ricotta cheese, 1 cup mozzarella and 2 cloves of minced garlic on a stove top. 3. Cook 9 whole-wheat lasagna noodles according to package. 4. In a 9x13” baking dish, spread 1/3 butternut squash on the bottom with ½ cup shredded mozzarella cheese. Layer 3 noodles and spread half of spinach filling and another 1/3 of the butternut squash. Repeat. Put the last 3 noodles on top and sprinkle with another ½ cup of shredded mozzarella cheese and 1 tablespoon of Italian seasoning. 5. Cover with foil and bake for 30 minutes at 350 degrees. You can find recipes similar to these at the Cabarrus Health Alliance’s monthly healthy cooking classes. Each month is a different topic and the classes are suitable for all health conditions and ages. Sign up today by visiting their website: http://www.cabarrushealth.org/299/Cooking-Classes.